What would you do if you had a wardrobe that travels in time? Well, I’ll tell you what the baddie of this week’s episode did: he travelled to different eras to kill women because he was traumatised by his own mother’s death at the hands of his father. Kids. To be honest, ‘The Time in his Hands’ served as an introduction to the new character of Pacino, who arrives to try to fill the void in our hearts left by the departure of Julián. Pacino is played by Hugo Silva, who already played a cop who didn’t like to follow the rules in Los Hombres de Paco, which also starred Michelle Jenner (Isabel). But, allow me to explain how this goes. 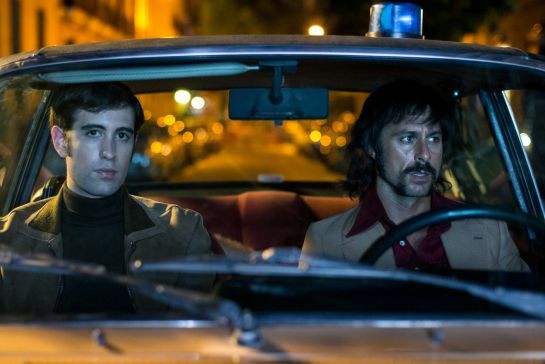 Pacino is a cop from 1981’s Madrid chasing a serial killer. When he sees the murderer escaping through a wardrobe, he chases him, only to end up in 2016. He is arrested and soon taken to the Ministry of Time, because back in 1981 Pacino was believed to have been the murderer –which means now he cannot go back to his own time. For Pacino, this was not just any case. You see, in 1946, his own father was a cop and chased the serial killer to the same house (the killer owns the building), where he saw the man disappear into the wardrobe. Driven by madness because no one believed him, Pacino’s father killed himself five years later, soon followed by Pacino’s mother, who died of grief. But because our team is so smart, they soon catch the murderer (Francisco Morán), but Morán, who has been donating money to orphanages his whole life as some sort of atonement, will only speak to Pacino. He tells the cop that he will tell him the names and location of the bodies of all his victims if Pacino does him a favour: travel to 1886 and kill his father, because that way the trigger that made him become a serial killer would never have happened. Of course, Pacino likes this plan, and then he tricks Salvador and all the others in the best possible way: he makes them think that he has travelled to 1946 to save his father there, when in reality he has escaped to 1886. The scene was beautifully done, showing the parallels between both stories just as they happened. In 1946, Amelia and Alonso try to stop Morán from killing a single mother, and Morán ends up grabbing Amelia and threatening her at gunpoint. In 1886, Pacino tries to stop Morán’s father from killing Morán’s mother, but Pacino is a smart guy, and hands the father a gun that’s not loaded, which gives Pacino time to shoot the man dead. Just as he does this, Francisco Morán in 1946 suddenly vanishes, leaving Amelia and Alonso bewildered. So in the end, Pacino disobeyed the rules, but this meant that Morán didn’t kill anyone (dying in 1930 of TB) and his own parents never died in the 1950s. This clearly distresses Salvador, who worries that as a result of this, the descendant of one of this now-not-dead women is going to become a dangerous criminal or something. But we all know that Salvador is an all-around nice guy, and his last act is to make sure that those donations that Morán now didn’t do still happen. So now we have Pacino with us, with his manners of a cool cop from the eighties, to join the team while Julián is gone. And speaking of Julián, Irene did one redeemable thing by discovering in his computer that he was in 1895 Cuba, but didn’t say a thing. BUT then it turned out that she was the mole and told everything about Julián to Susana. Seriously. Oh my god, next week we are going to travel to meet Miguel de Cervantes! (played by Pere Ponce, from Isabel). And Lope de Vega will be back (played by Victor Clavijo, from Carlos, Rey Emperador). Can’t wait! -Hugo Silva and Michelle Jenner just made a movie together, Tenemos que Hablar (“We have to Talk”), which will be released next week in Spain. -And last week it was La Corona Partida! I will review it as soon as I see it when I go to Spain next month. -One of the team’s tasks was to travel to 1997 to convince Pau Gasol to stop studying Medicine and play basketball. Thank God for this Ministry. -“I wish you a long and fucked life.” You have to love Salvador. -Did you notice that the beginning of the intro has been changed? It now features bits of Pacino’s life. -My favourite running gag of the week: Alonso referring to Pacino as ‘Chapino’. -And here is this week’s instalment of The Ministry’s Files.